his international conference, the first to focus on this field, brings together specialists working on aspects of memory, oral history and oral tradition in Iranian languages, whose disciplines include anthropology, history, literature, psychology, and religious studies. The conference will consider wider theoretical approaches within the context of Iranian cultures. The world-wide phenomenon which Pierre Nora has termed ‘the current upsurge in memory’ has provoked a corresponding academic interest, all the more pervasive for being multidisciplinary. The ‘upsurge in memory’ which has touched Europe and the US has also been noticeable in the Iranian cultural area. At the time of official commemoration of the 25th anniversary of the Islamic revolution, academic interest in popular historical discourse is growing; in Central Asia, the evolving post-Soviet national identities make use of totemic past events; in Kurdistan, national history is being created – by normal State means in the Kurdish area of Iraq, and by unofficial Kurdish political and media activity elsewhere. In all these cases, remembrance and commemoration are actively used to forge stronger national and community identities. Accompanying this in many areas is the urge felt by many to record their own lived memories and the events that they or their ancestors witnessed . Some are making these memories public in published books, others on the internet. The latter in particular may partly be seen as part of the global trend towards publication of personal discourse, but this phenomenon is also a normal response to upheavals across the whole region over the last thirty years – the Iranian revolution, wars in Afghanistan and Kurdistan, the fall of the Soviet Union – and a consequent desire that sufferings should not be forgotten. The interest in the past prevailing in the Iranian cultural area is not merely the result of nebulous ‘globalisation’ or even the activities of the vigorous diaspora communities originating from the region, but is, at least in part, the product of a traumatic recent history. A number of specialists currently work on subjects linked to memory in the Iranian cultural area. Subaltern history, and history from below, have recently been considered in academic conferences on Iran (Amsterdam 2001, London 2004). Rituals of commemoration and remembrance have also formed part of wider studies of group and national identity. However, despite the number of researchers working on such material as oral traditions, lamentations, oral history interviews and life stories in Iranian languages, these verbal discourses of memory are for the first time the subject of an international academic conference. 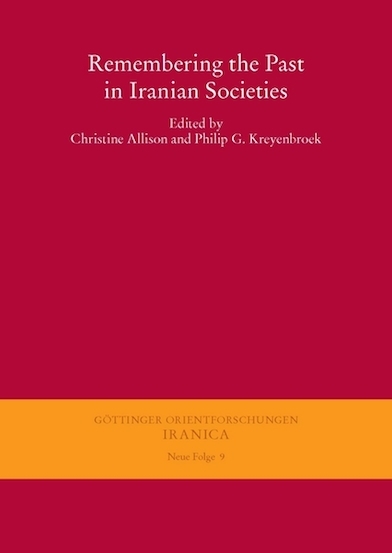 Convened by Christine Allison (Mondes Iranien et Indien, CNRS, Paris) and Philip G Kreyenbroek (Georg-August Universitaet, Goettingen) and published in 2013 as a book ‘Remembering the Past in Iranian Socieites‘.